House Minority Leader Nancy Pelosi's spokesman has called on Republicans to condemn "reckless and dangerous rhetoric" after Pelosi was confronted by an "angry mob" of far-right protestors in South Florida. House Minority Leader Nancy Pelosi's spokesman has called on Republicans to condemn "reckless and dangerous rhetoric" after Pelosi was confronted by an "angry mob" of far-right protesters in South Florida. Pelosi, D-Calif., made an appearance on Wednesday at a Coral Gables campaign event for Donna Shalala, the Democratic candidate who hopes to fill the District 27 U.S. House seat vacated by retiring Republican Rep. Ileana Ros-Lehtinen. 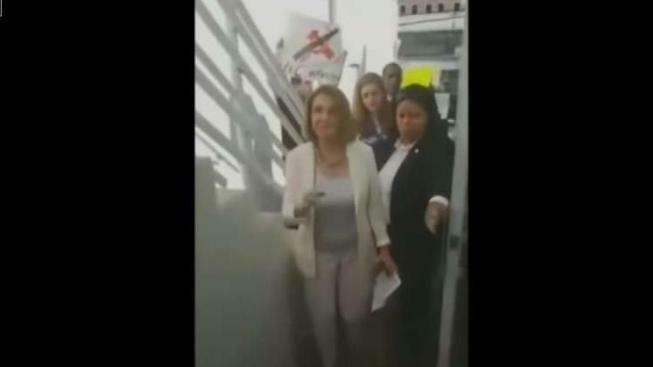 As Pelosi and her team entered the building through a back walkway for the event, a group of protesters approached and began hurling insults at Pelosi – calling her everything from a "piece of s---" to a "f------ communist." "Open up! It’s the Proud Boys in here," one of the protesters is heard saying in a video posted to YouTube. The Proud Boys is a men-only, far-right organization founded in 2016 by Vice Media co-founder Gavin McInnes. The Southern Poverty Law Center has designated the Proud Boys as an extremist hate group. A Proud Boys flag was waved during the demonstration in which some protesters were seen wearing Proud Boys gear. In response on Friday, Drew Hammill, Pelosi's spokesman, blamed President Donald Trump and Republican congress members for stoking the "flames of incivility, intolerance and aggression." The Washington Post reports that the protest appears to have been organized by Miami-Dade County Republican Party Chairman Nelson Diaz, citing emails posted online. In a statement, Diaz apologized for letting his "emotions get the best of me" during the demonstration and distanced himself from other protesters who "came with a different agenda." "I unequivocally denounce their actions. I denounce all hate," Diaz wrote. "I and the Miami-Dade GOP share no affiliation whatsoever with those individuals and believe there is no place in our society for hateful language, or violence against any person or group regardless of their views." The Florida Democratic Party on Saturday called for Diaz to resign. "The Proud Boys' hate has no place in our nation, and their violent tactics certainly have no place in our politics," FDP chairwoman Terrie Rizzo said in a statement. "It is appalling that the Miami Dade GOP Chairman, Nelson Diaz, would campaign alongside a known hate group and welcome its members within his party. He should resign immediately and take anyone who espouses the Proud Boys' ideas out the door with him." U.S. Sen. Marco Rubio, R-Fla., also denounced the protesters' actions. "You are not helping the cause of anti-communism if you behave like the repudiation mobs Castro has long used in Cuba. Not sure who was behind this behavior but you should have protested Pelosi campaign stop without borrowing the tactics of left wing mobs," Rubio wrote on Twitter. Hammill replied to Rubio's Twitter post. "These weren't anti-communism protestors. These were GOP operatives, including the Chairman of the Republican Party in Miami Dade County, working hand in hand with Proud Boys," Hammill wrote. Proud Boys members have been arrested in connection to a New York City street brawl after a speech McInnes gave last weekend.